Magnus Midtbø repeated Ali Hulk Extension (5.15a) in Rodellar, Spain’s Ali Baba cave. You can read more about it on his blog. Jonathan Siegrist has taken quite nicely to the unfamiliar terrain at Rifle, CO as evidenced by his recent quick repeat of Roadside Prophet (5.14a) and FA of the extension to the notoriously difficult 5.13d Living in Fear. The extension, which was equipped and sent 2nd by Sam Elias, has been dubbed Living The Dream (5.14a/b). As part of his recent trip Siegrist also sent Mutton Bustin (5.14a/b) in Maple Canyon, UT as well as Dead Souls (5.14a) in American Fork Canyon, UT. According to his scorecard Alex Honnold repeated a variation to Superman (5.14c) called Supermanboy (5.14c) in Chek Canyon, Squamish, BC. His comments for both routes indicate he was able to find numerous rests which led him to think both might be soft for the grade. Pete Kamitses repeated Sonnie Trotter’s The Path (5.14 R) at Lake Louise in Banff National Park, Alberta, Canada. Check out this post on Mammut’s blog for the full report. Since returning from the U.S. back to his native Australia, Chris Webb Parsons has managed 2 new V14s on the boulders around Sydney. According to his website he has opened A1 and One Of A Kind. According to his scorecard Daniel Woods nabbed the 2nd ascent 3rd ascent of Dave Graham’s recent addition to Mt. Evans’ Lincoln Lake, The Mote In God’s Eye (V14). Chris Schulte got the 2nd ascent. Adam Ondra and Jain Kim won the Sport Climbing World Cup in Xining, China over the weekend. Full results here. 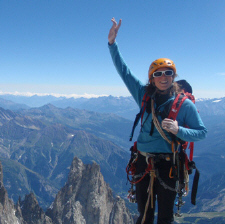 Unfortunately the biggest news that happened over the weekend was the untimely passing of Belgian Chloé Graftiaux who took a fatal fall while descending the L’aiguille Noire de Peuterey on Mont Blanc in Italy. Best known here in the U.S. for winning the World Cup bouldering event at the 2010 Teva Mountain Games, Graftiaux was just 23 years old. You can leave comments of condolence on her website here. It seems this summer is filled with a constant stream of crushing tragedy. Chris Schulte actually got the 2nd ascent of Mote, and Daniel got the third. Excellent, thanks for the clarification Jackie. actually i beat chris to the 2nd ascent, he and Daniel are 3rd and 4th, respectivly. secret solo sessions are my favourite! I’m sure it’s a only a misunderstanding.